Most popcorn connoisseurs have foregone the stovetop, air popping and microwave methods of making popcorn. Those ways to make the tasty treat just don't have the true flavor of good old fashioned popcorn machine popcorn. Nothing tastes better than hot, fresh popcorn right out of the machine. A lot of people think that a popcorn machine is expensive. Sure, if you are looking to buy one that is the same size used in a movie theater, it'll cost a small fortune. 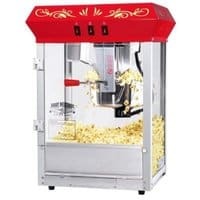 However, there are some really affordable models on the market today that will allow you to make popcorn machine popcorn right in your home. Manufacturers have made the in-home popcorn machine small enough to fit on a table but big enough to produce enough popcorn for a family or gathering. Different machines have different size kettles. You would need to select the size needed for your situation. The designers have also paid great attention to detail on some while others are plain. Quite a few of the machines look like the old fashioned popcorn machine that was used at carnivals. One of the great features of the popcorn machine is that it keeps the popcorn hot. All of them have a heat lamp but some even have a warming element underneath the holding area. This is really convenient as you could shut the lamp off while watching a movie but the popcorn will still stay warm. The popcorn machines made today are quite efficient. Most of these units can pop four ounces of popping corn in less than three minutes. That's even faster than a microwave and tastes so much better. Most are really easy to clean. The kettles are usually simple to remove but the stirring mechanism stays inside of the machine. You simply need to wipe out the kettle and replace it. A tray slides out from below the popcorn machine so that the kernel crumbs can be removed quickly and easily. It's a snap to make popcorn machine popcorn. The oil needs to be placed in the hopper first. Then, you need to measure and pour the popping corn into the kettle. Close the door and turn on the kettle and heat lamp. Depending upon which machine you are using, you could very well be noshing on hot and fluffy popcorn in three minutes!